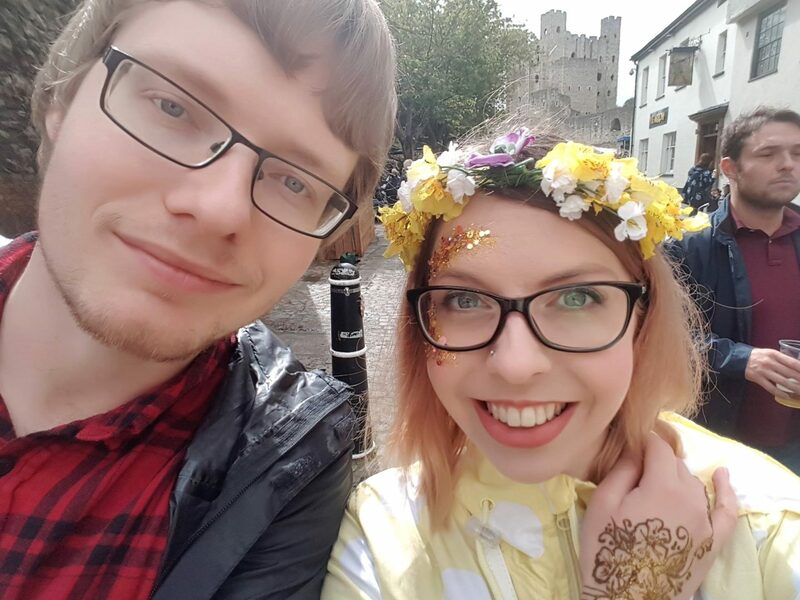 On Monday 1st May we went to the Sweeps Festival in Rochester. An annual event, it is held over the first bank holiday weekend in may. 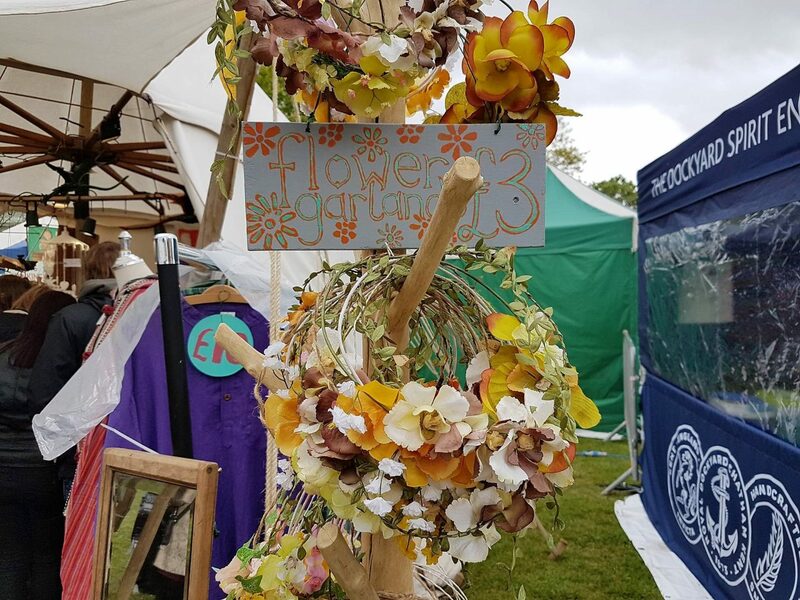 If you visit, you can expect an array of wonderful stalls, as well as dancing, music and other entertainment. There are many wonderful historic traditions instilled within this festival. What is the history of Sweeps Festival? Chimney sweeps were allowed to have a holiday one day a year on the 1st of May. On this day, the chimney sweeps would ‘[hold] a procession in Rochester to collect money’. The celebrations were held for the last time in the early part of the 20th century, however, it was revived in 1981. Jack o’ the green is awakened at sunrise on nearby Bluebell Hill on the 1st of May. In the 16th and 17th centuries in England, people made garlands out of leaves to celebrate May Day. However, it is unclear how this became associated with chimney sweeps. 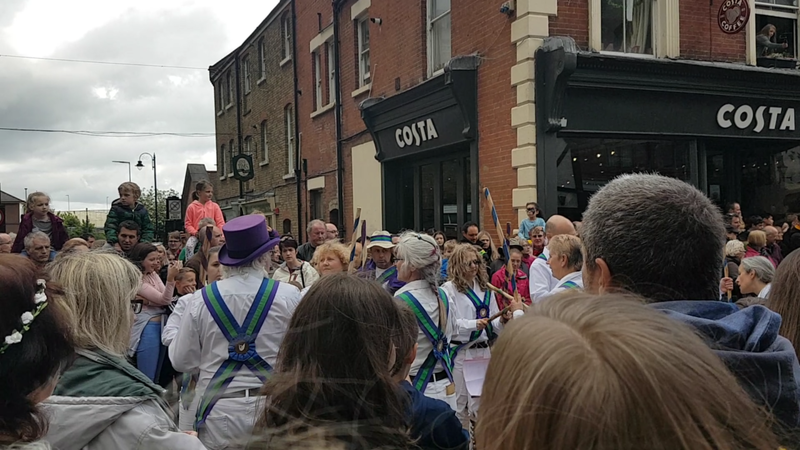 What does the Sweeps Festival in Rochester involve? 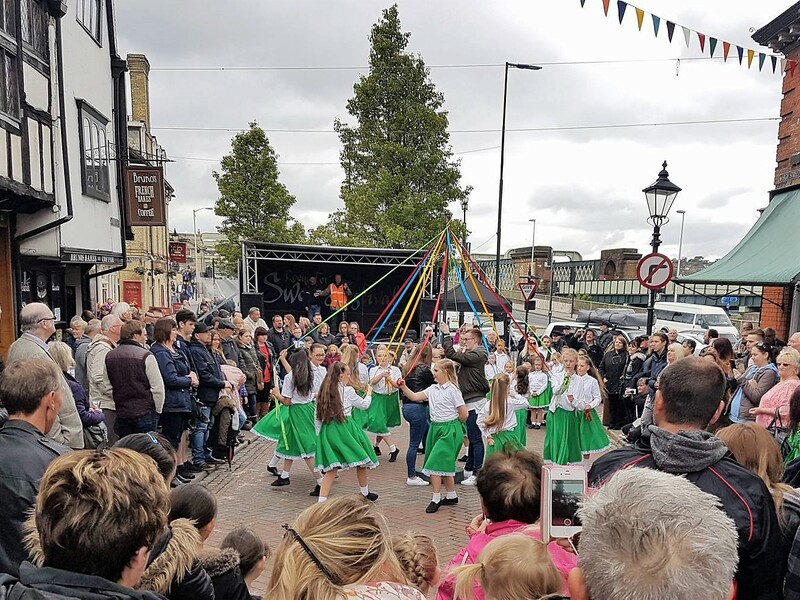 The Sweeps Festival in Rochester is a three day event. 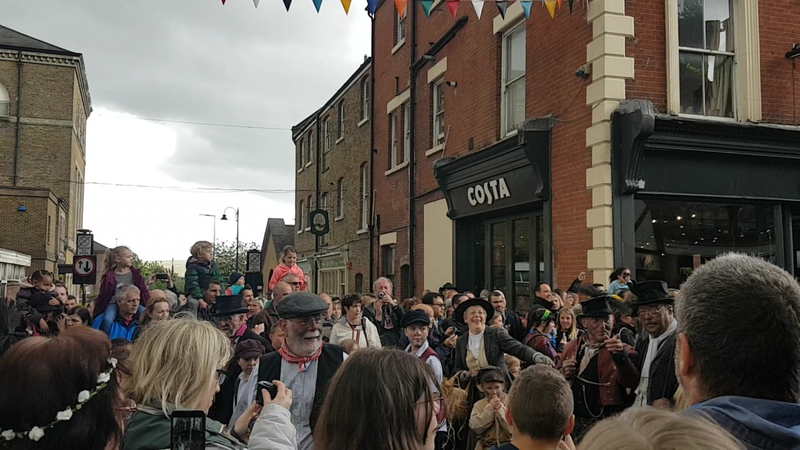 It involves music, dancing, an array of stalls, the awakening of Jack o’ the green and the chimney sweeps’ procession. There was a huge variety of stalls. 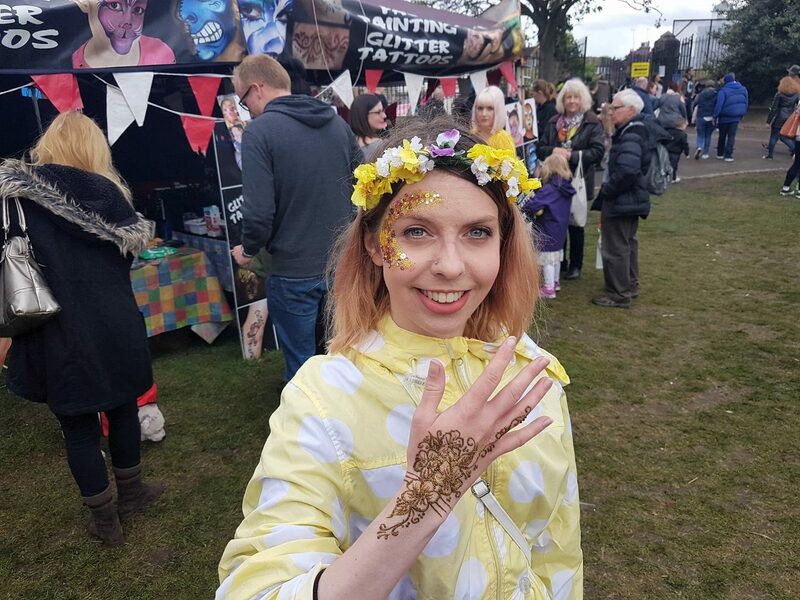 From food to psychics, to clothing to jewellery, there was something for everyone. Joanne’s Preserves were there, with a vibrant pink stall you couldn’t miss. They sell jams, pickles and relishes which are homemade in Upchurch, Kent. All produce is locally sourced, there are no artificial colours or flavours, they’re gluten and allergen free and all preserves are seasonal. There are some very unusual flavours too, such as Jumble Berry Jam, Hot Marrow Pickle and Rhubarb & Vanilla Jam. My husband selected garlic pickle and I chose some delicious tomato and chilli jam. Core Juice had various flavours of apple juice, alongside cider for sale. Ridiculously, I consider myself something of an apple juice connoisseur – and theirs is lovely! I savoured every mouthful. 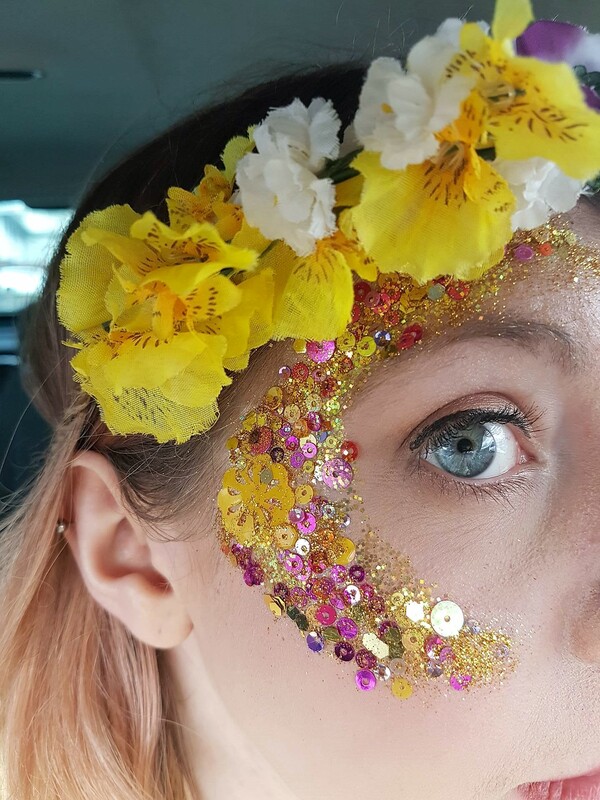 Follies were there to help everyone get into the festival mood with face painting, glitter tattoos and henna. I opted for a glittery eye and some henna! It was their 24th festival and I was told that their business was actually inspired by the Sweeps Festival. I bought a beautiful ring from Joanne’s Hampers and Pampers and a peanut butter brownie that I had from The Chocolate Hut was delectable! I’m quite fussy about chocolate brownies, but as David Jason might say, it was ‘perfick’! One of my other most favourite stalls there was Trade Winds. They sell unusual jewellery, some of it celtic. I adore it and will be visiting them again at the Dicken’s Festival when they return to Rochester in a couple of months! They also had lots of other lovely clothing and bags on their stall which was in a kind of tent that almost looked like a yurt, which suited their bohemian vibe! There were stages with bands playing music. 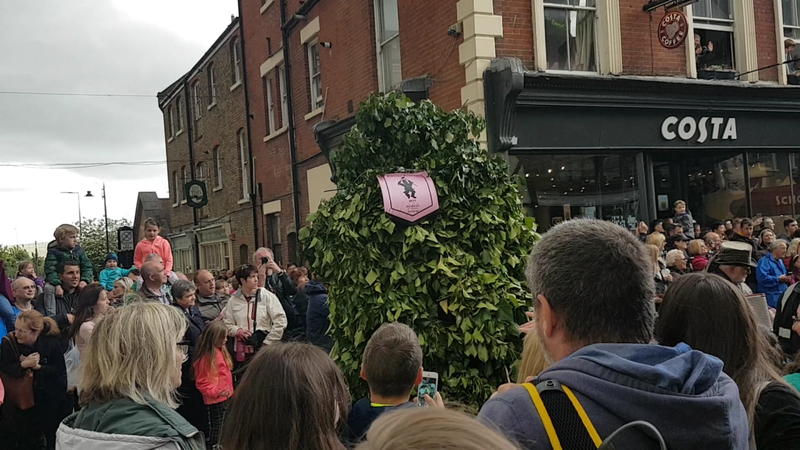 There were also dancers at several places in the high street during the day. We enjoyed watching girls dancing around the maypole when we arrived in Rochester. It was lovely to see the traditional dance taking place. 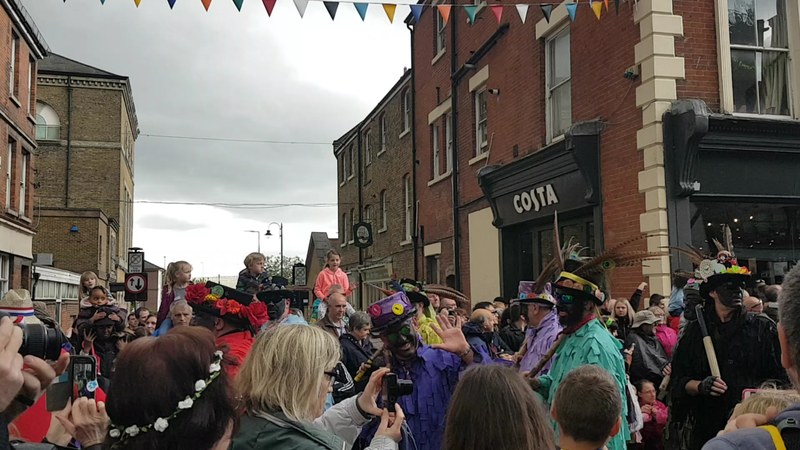 There were also a multitude of morris dancers of differing varieties – this festival is actually the largest gathering of morris dancers in the world! I think my personal favourites were the Border Morris dancers who perform an energetic dance with sticks. 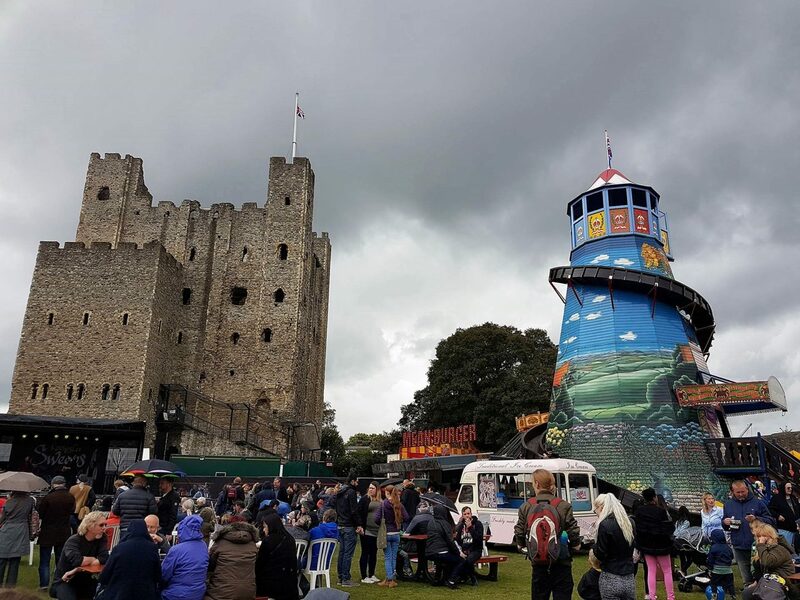 There were also stages with music being played throughout Rochester as well as a helter-skelter and rides in the grounds of the castle. 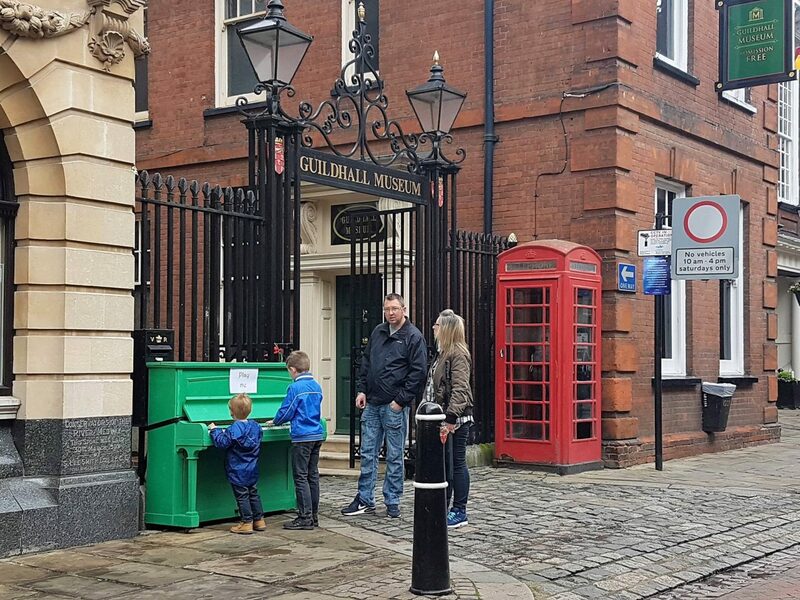 In various locations, there were also brightly coloured pianos for children to play on! The procession is where the Sweeps Festival weekend officially ends. Street sweeps, an array of dancers and scout groups parade from Star Hill, along the High Street and up to the grounds of the castle! The High Street gets absolutely packed in anticipation, so even with 10-15 minutes to go, I struggled to get a particularly good spot! As the procession goes on, the dancers stop at intervals to dance, to the delight of the crowds! The procession was amazing and there were so many lovely stalls! However, a few things really made my day. The first was meeting Martyn from Inside Martyn’s Thoughts. He’s the second blogger I’ve met so far and it was great to meet him after talking online for quite some time. 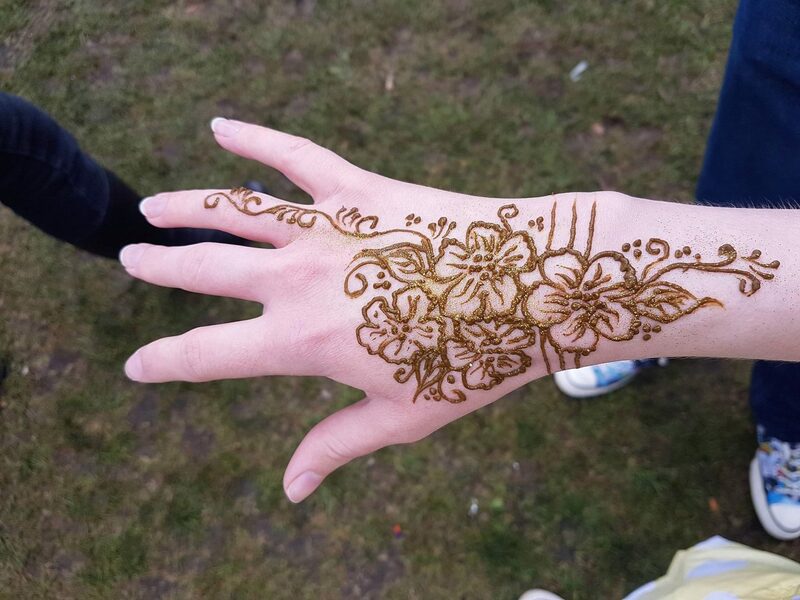 I love having henna done, so that was brilliant too. I’ve had henna done several times and always enjoy the intricate design that it leaves for a few days after it’s done. 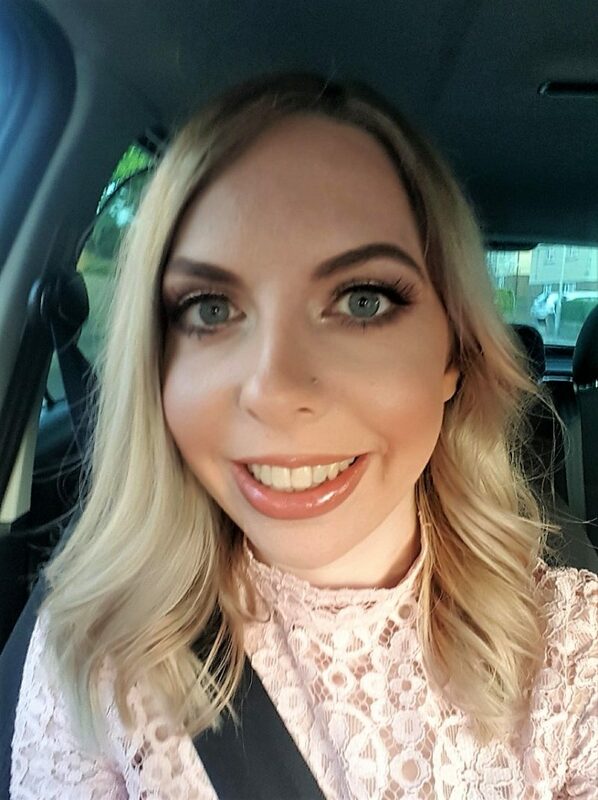 As for the glitter eye I had done, I wish I could walk around like this every day! However, most of all I loved all the festivity and having fun pending quality time with the ones I love! Even if one of the ones I love was a tad sleepy! 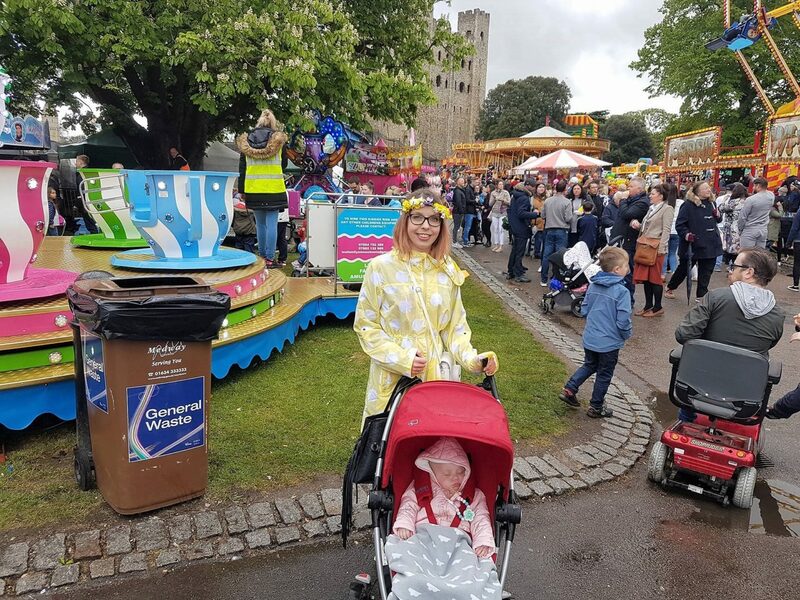 Once again, Sweeps Festival didn’t disappoint, despite the rainy weather. I’m already looking forward to the Dickens Festival (June) and Dickensian Christmas Market (November/December). They are also well worth a visit if you’re in the area!